I flew as a corporate jet pilot for 25 years, accumulating 10,000 in fixed wing aircraft. I am currently employed by FlightSafety International as a professional flight instructor and FAA examiner in the CE-750 jet (Cessna Citation X). Drone flying started as a hobby, and developed into drone aerial photography (both stills and video). I have 1 year experience flying several top-end drones including: DJI Phantom 4 Pro+ Obsidian, DJI Mavic 2 Pro, Yuneec Typhoon H Plus Hexacopter and Autel Robotics EVO. 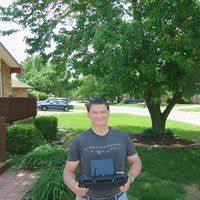 I am an excellent FAA licensed Part 107 drone pilot eager to get those difficult still or video shots that you need for your business!